If you are looking for a great vacation spot this spring season, Table Rock Lake in Branson is the place to go. This most visited vacation destination in the Ozarks is a fantastic place to enjoy water sports activities such as boating, fishing, jet skiing, parasailing, swimming, and more. Spring break in Branson is a great time to see the long-awaited beautiful sunshine with occasional rain showers and first sightings of spectacular lush greenery. This man-made Table Rock Lake was created with the collaboration of the U.S. Army Corps of Engineers to measure the flood control along the river. Spring season is a time where most of world-class live entertainment shows start to open. After you have enjoyed a wonderful time in Branson’s entertainment district, don’t miss to see spectacular first bloom of flowers and plants on the lakeside scenery and the chance to enjoy great water activities on the lake. During spring season, Branson’s temperature averages between 50 degrees to 80 degrees which has a perfect blend of sunny and warm weather while the nights have refreshing temperatures. Table Rock Lake is really a perfect family spring break destination as it offers several outdoor activities and water sports adventures. Along the banks of the Table Rock Lake, you will find dozens of attractions. The scenic beauty of the wooded valleys, fascinating shoreline of the lake, bluffs and wildlife are well preserved by the area’s environmentalists and conservationists. The shoreline of the lake spans 750 miles and covers an area of 52,300 acres. The lake has an abundant supply of large bluegill, bass, and crappie. You will also find catfish of all sizes at the bottom of the lake. If you want to go boating or fishing, boat rental is available in marinas and other area resorts around Table Rock Lake. There are several fine restaurants on the lake that serve boaters and other water enthusiasts. These restaurants offer delicious treats with free boat docking. In the area, you will find full-service marinas that offer delectable foods and other boat supplies while you are refueling the boat. You will also find great eateries in Kimberling City near Table Rock Lake that serve tasty foods from local choices to home favorites. There are also several dine-in restaurants that offer evening live entertainments during weekends. Table Rock Lake has more than 100 resorts that can make your lake adventure truly exciting and enjoyable. Your spring break vacation in Table Rock Lake will not be complete if you don’t try a river boat adventure. If you are hesitant to man the boat, you can take a ride in one of the commercial boat cruises that operate around Table Rock Lake. These boat cruises operate from many locations so that they can provide good service to many boaters around the lake. 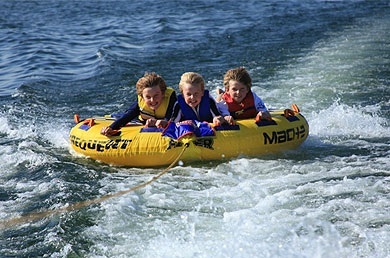 So, if you want to enjoy the best of your spring break vacation in Branson, experience and explore some of the many water sports activities in Table Rock Lake.